Being a campaign pitch. Other related posts can be found under the Pahvelorn label. Several generations past, the ambitious lord Arios set out into the wilderness to extend the reach of civilization. In consultation with his sorcerer Ismahir (for all wise lords have a wizard), he selected a hill called Pahvelorn for his stronghold and raised up a mighty fortress. He drove the giants away and slayed several dragons. The populace prospered. But then strange things began to happen around the fortress, and Ismahir was gone for months at a time. Unnatural creatures would emerge from the dark spaces beneath the castle. Other advisors begged Arios to be rid of the wizard, but he was loyal to his old companion. Then, one day, when Arios was out on the hunt, he heard a terrific roar and the earth shook. He immediately returned to his fortress to discover only a giant pit in the earth where but days before had proud Pahvelorn stood. Above, clods of dirt and worms rained down from the fortress as it rose into the cloudy sky. Ismahir was never seen again. In the pit below where the hill had once been, dark things writhed and hissed in unfamiliar daylight, even the pale light filtered by the day’s heavy clouds. Or, so go the stories. All we know for certain is that most of the good people left soon after the castle ascended into the overworld. Bereft of family and distrusted by the villagers, Arios vanished into the wilderness with his most loyal men, seeking to redeem himself the way he first gained glory. Now, half ruined, the village Zorfath perches over the edge of the pit, the haunt of mercenaries and treasure hunters, a gateway into dark places opened by the castle’s leaving. A shadow has been recently seen over the land, however. Crops wither where it passes. After a 101 year absence, the fortress is returning. System is OD&D. The 3 LBBs plus the thief from Supplement I: Greyhawk. Human only. Proposed venue is G+ hangouts, every week or so, and would use the excursion format (so consistent attendance would not be required). 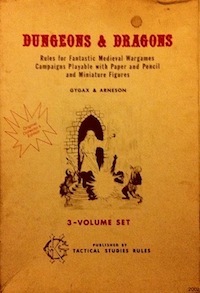 Having access to a copy of the rules is not required; character generation rules will be provided. More details about rules to come later. This entry was posted in Uncategorized and tagged Pahvelorn on July 3, 2012 by Necropraxis. Awesome premise! Looking forward to hearing more about this. I don’t even need to read your campaign pitch. I am in. Give me a time and if at all possible I will be there. Do you know what day of the week you’ll be running this? Partly it will depend on what days seem good for people that are interested. Any preferences? What time zone are you in? I’m in PST, so that would be 6-9 for me, which is nice. I can game on Mondays at that time, but not on Wednesdays. Regarding the first session, how does Monday, July 23, 9 pm – 12 pm EST work for people? I’m sorry I haven’t responded; I’m pretty sure it will work for me. That makes four confirmed players, which is a good number. I’ll send you a hangout invite at the appropriate time tomorrow. See you then! Do you prefer us to have our characters generated before we begin or do you want to that together? Sure, feel free to go ahead and create one. Let me know if you have any questions. You don’t need much of a background unless you want one. I’m just going with the assumption of treasure hunters out to make their mark on the world.